(click image for large view) The Combat Vehicle Reconnaissance(Tracked) CVR(T) Scorpion is a lightweight, full tracked, armoured reconnaissance vehicle with a 76mm medium velocity main gun. 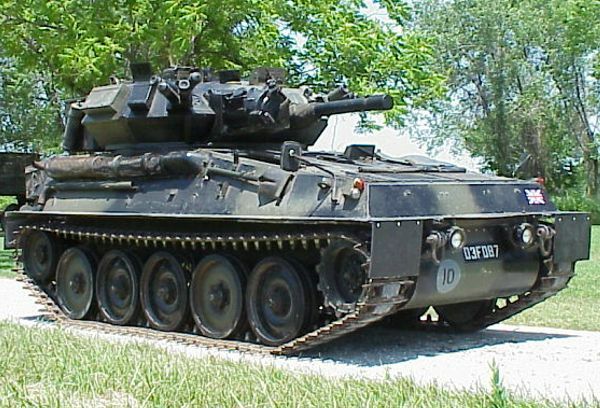 The Scorpion was the first of a series of armoured vehicles built on similar chassis. The Scorpion’s Jaguar 4.2 litre J60 6 cylinder petrol engine and TNX15 7 speed transmission would propel the 17500 lb vehicle up to 50 mph. The vehicle has a crew of three. The driver is located in the lower hull while the commander and gunner are situated in the 360 degree traverse turret. In addition to the 76mm main gun the vehicle also has a 7.62mm coaxial machinegun and 2 smoke dischargers. The vehicle can carry 40 rounds of 76mm ammunition including HESH(high explosive squash head), HE, and smoke, illumination and cannister. Originally a floatation screen was fitted around the vehicle which could be erected for use. Most of the floatation screens were removed while the vehicle was in service. The vehicle was propelled in the water by the tracks. An NBC pack was fitted to the rear of the hull to allow operation in a contaminated environment. Notes For Collectors: In my opinion this is the ultimate military vehicle for the collector. Or should I say for the collector that has a big enough back yard to enjoy this vehicle. Although over 3500 CVR(T) vehicles were produced only a small percentage were Scorpions. Many Scorpions were converted into Sabres when the British Army took the Scorpion and Fox out of service thus reducing the number sold off. Buying a Scorpion is a much better investment than buying a new car. At 17,500 lbs a Scorpion can be transported relatively easily to a show or parade. I know of one having been moved with an F-250 pickup and a gooseneck trailer. Driving one is quite simple. It is the racecar of tanks. It starts, stops, and turns very well. The tracks have permanently attached rubber pads that prevent road damage. The physical size permits storage in many household garages. If you are any kind of modern armour collector at all you have to have one of these. Unfortunately Scorpions are not inexpensive anymore. Once in a while one will come on the market.